Published By – Spheric B.V. This is the second pressing of the 2013 Audio Fidelity remaster. Reissue pressings limited to 5000 copies. A Golden sticker is not placed on the back side sleeve / "NOT NUMBERED". 180+ pure virgin vinyl, analogue pressing. Film stills courtesy of Warner Bros. Pictures and The Blade Runner Partnership. 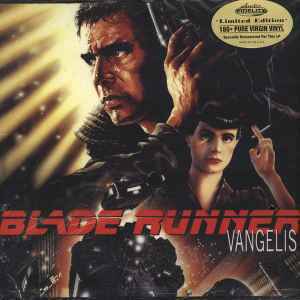 "Most of the music contained in this album originates from recordings I made in London in 1982, whilst working on the score for the film Blade Runner. Finding myself unable to release these recordings at the time, it is with great pleasure that I am able to do so now. Some of the pieces contained will be known to you from the Original Soundtrack of the film, whilst others are appearing here for the first time. Looking back at Ridley Scott's powerful and evocative pictures left me as stimulated as before, and made the recompiling of this music, today, an enjoyable experience." ℗ & © 1994 & 2013 Atlantic Recording Corporation. One of the best reissue pressings that I have in my collection. I think it goes without saying that every reissue should sound as good as this one. The sound of this pressing is fantastic! One of the best sounding records I have. To put it bluntly this soundtrack pressing is the f***ing business. As good a record pressing as it comes. i concur with the below discogger.. The superb sudden and near overwhelming sound, And the crispness of it is exactly what you buy records for. Probably the best sounding LP i own. Good to know proper pressings still get made. This is in the top 10 of best sounding records I own. Excellent remaster by Kevin Grey, excellent, quiet pressing, excellent soundtrack! Like Blaine78, I am enamored by the deep and heavy red vinyl. It is beautiful to behold. The music is sublime if incomplete. To get the full score one has to track down a 5 disc set from Romania. If one can live without, then this is likely the best anyone will ever get for these fine tracks. The vinyl is well pressed and quiet. The dynamics are wide and the mastering is excellent. With the recent popularity of 80s films and the heavy synth scores that accompanied them, this album hints at a certain timelessness. Spinning this and easing into the soundtrack for Drive makes for a very fine couple of hours. this amazing red vinyl release makes me damn happy. heavy weight red vinyl, thick high gloss gate-fold cover, and importantly, the press quality and mastering.